A monocular is, essentially, a small telescope that offers a greater degree of magnification of distant objects. This device is similar to the scope that many hunters and gun owners use on their rifles, but is handheld and can sometimes be much smaller. It is also similar to a pair of binoculars, only with one lens instead of two (hence the name). While binoculars provide a greater degree of stability and focus, a high quality monocular is easier to carrier and can still provide a great deal of clear magnification. When it comes to hunting, finding the right monocular can mean the difference between accurately locating and hitting a target and missing every time. A monocular allows hunters to observe figures and objects at long distances to determine if they have found their mark. These highly portable and lightweight devices are highly prized, and often more useful when you are already lugging about heavy gear. The following list will go over some of the top hunting monoculars available today, their specifications, and any other relevant details that can help you make the best decision for your monocular purchase. This high quality monocular is lightweight, waterproof, fogproof, and can be attached to a tripod, if needed. For individuals who wear glasses, the adjustable eye cup makes it easier to create a comfortable and useful eye relief zone that still gives the user a full field of vision. The Wingspan Optics Outdoorsman 8 x 42 Compact Wide View Monocular is perfect for both beginners, experienced hobbyists, and the skilled hunter to easily store and use in the field. In addition to this monocular's high quality internal design, the tool also comes with a highly durable rubber covering that is meant to protect the monocular from drop damage. It also comes with a nylon mesh carrying case, microfiber lens cleaning cloth, and a neck strap. 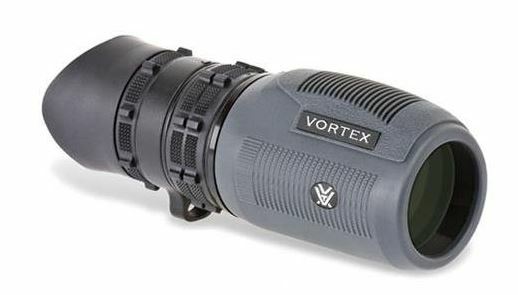 The Vortex Optics Solo R/T 8 x 36 Monocular comes with a ranging reticle focus for more accurate targeting and range estimation. 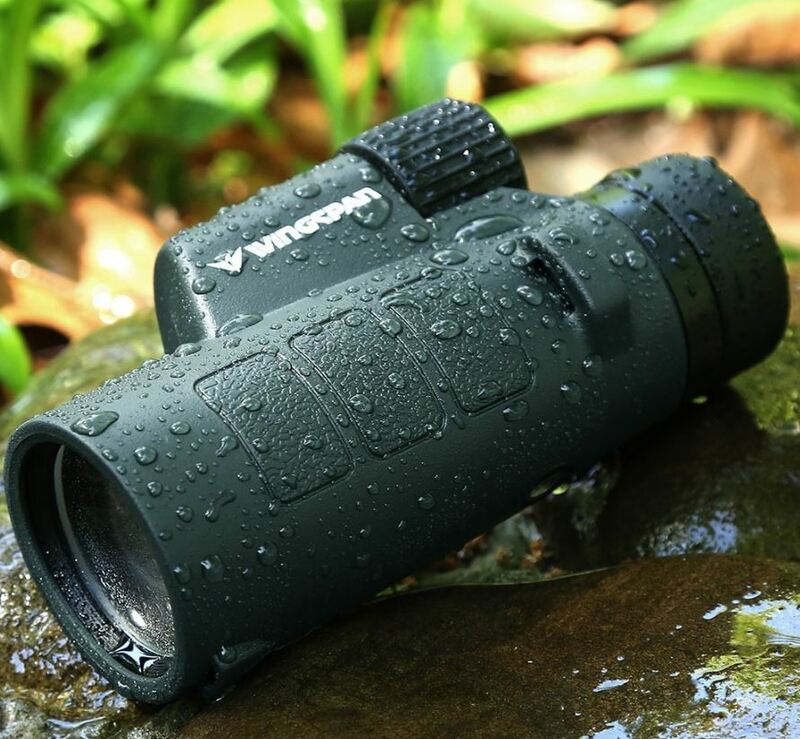 This monocular is very lightweight, compact, waterproof, fogproof, and shockproof. Its flared, adjustable eye cup gives ample eye relief for individuals with glasses and is comfortable for those without. The flared design of the eye cup is also perfect for keeping stray light out of your field of vision, which creates a clearer, crisper image. The monocular is covered in a tough rubber shell to protect it from drop damage, and involves a series of O-ring seals and nitrogen purging capability that make it a highly efficient magnification tool. Vortex Optics also provides an integral utility clip that can attach to webbing or other flat-edged surfaces to keep it in reach at all times. This monocular also comes with a soft carrying case and a neck lanyard. This monocular is fully waterproof and fogproof and is made with a twist-up eye cup that provides a comfortable eye rest. It is also highly compact and lightweight and comes with a Picatinny rail mount that can be attached to a number of different accessories, including lights, sights, and so on. The tool combines low-dispersion glass with BAK4 prisms to provide the clearest and most high-definition magnified image possible. The thick rubber covering on the monocular provides ample shockproof and damage resistance as well as a strong and comfortable grip. The product comes with a clip for easy transportation, and can be attached to a tripod if needed. 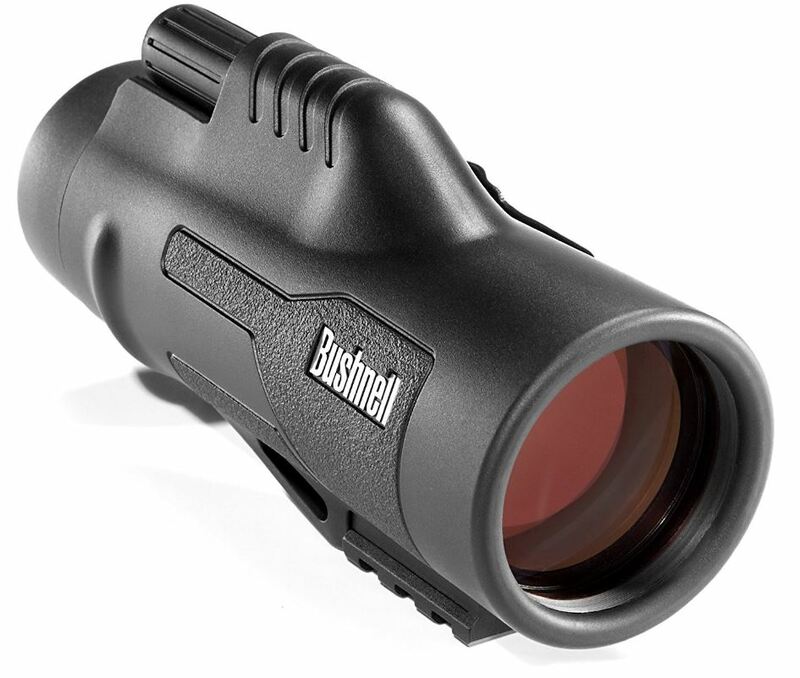 Bushnell's Legend Ultra HD Monocular lens is also built with their patented "RandGuard HD coating" which makes this a truly powerful tool in all kinds of weather. This monocular is equal parts excellent magnification device, night vision monocular, and lightweight, portable camera. The night vision component has a 3x magnification that offers a decent amount of vision when used in the dark. On the monocular, the interface menu is easy to use and the monocular can be set up on a tripod if needed. 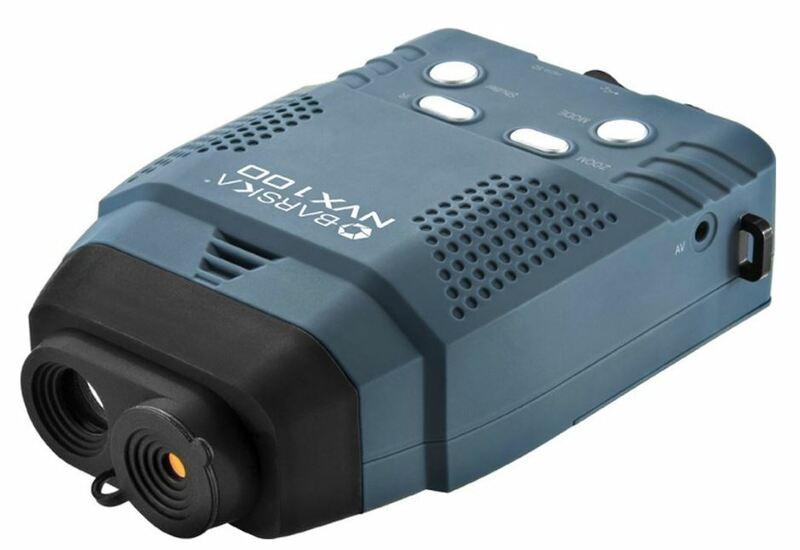 The battery life of this monocular/camera combo is between two and five hours, and requires 4 AA batteries to operate (which are not included with the device). Each Barska NVX100 3x Night Vision Monocular comes with a 1 GB SD card, a mini USB cable, AV cable, neck strap, and soft carrying case. This monocular/camera combo can be attached to your computer to download pictures and video or to your TV to display pictures and video. Images and videos can also be viewed through the monocular's internal view screen. One big downside to this monocular is that it is not waterproof, so it will not be usable in all outdoor conditions. If you aren't keen on having your video and monocular in one unit you can always purchase a good standalone hunting video camera. This low-priced monocular is super compact and lightweight, which is perfect for the hunter looking for that magnifying tool that can easily fit into an outer pocket. For its diminutive size, the Celestron Outland 6 x 30 Monocular offers quite the impressive field of view and provides an exceptionally clear image. The compact monocular can also be used comfortably with glasses, as it provides and excellent eye relief range. Waterproof, fogproof, and rubber coated for drop protection, this Celestron compact monocular is a powerful little tool that is well worth its low ticket price. The monocular comes with a soft carrying case, a microfiber lens cleaning cloth, and a neck strap. It would be difficult to find a monocular with the same high degree of quality as this Celestron at such an affordable price. This incredibly high powered monocular comes with a "quick alignment" smartphone adapter that allows you to seamlessly record your experiences and easily attaches to the back of the device and can fit nearly any size and shape of smartphone on the market. The monocular is covered in a shockproof rubber armor that includes a large rubber stripe that runs on both sides of the device for better grip and more comfortable handling. This monocular is completely waterproof, dust proof and fogproof. 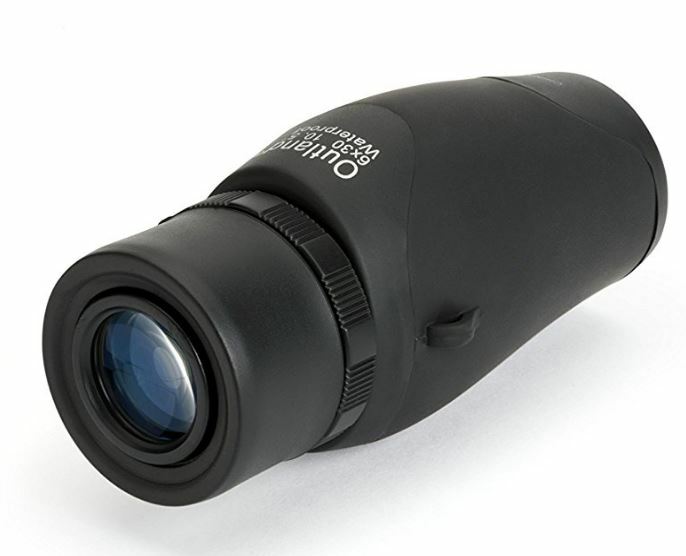 This high powered monocular is perfect for long distance viewing. 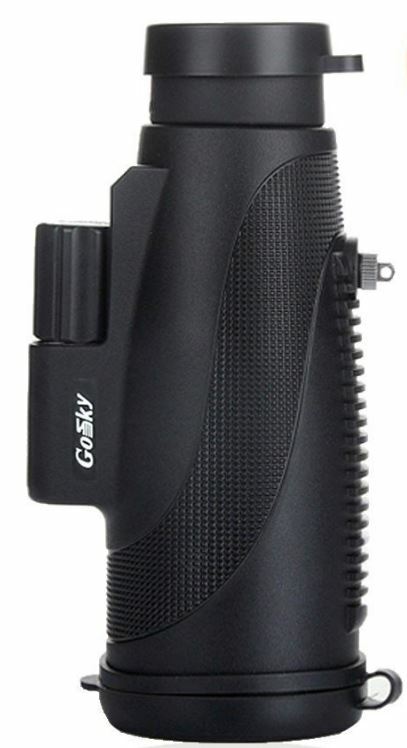 Gosky's addition of the smartphone adapter also makes it an efficient recording and picture taking device, though the monocular itself does not suffer from the limitations of a monocular/camera combo (such as not being waterproof). The monocular also has an adjustable eye cup that gives it a good eye relief range for glasses or without glasses. Each Gosky Titan 12 x 50 High Power Prism Monocular comes with a carrying bag, eyepiece and lens protection covers, lens cleaning cloth, and a strap. Leica offers an exceptionally high quality compact monocular that is lightweight and can effortlessly magnify the finest of details at a distance. The monocular comes with a close focus lens, that allows for magnification of objects within 10 to 12 inches clearly (compared to its normal 6 feet of close focus). This close focus lens is easily screwed on and off of the device, and can be stored in the leather carrying case when not in use. This monocular is also equipped with a comfortable eye cup that allows for 15 mm eye relief. 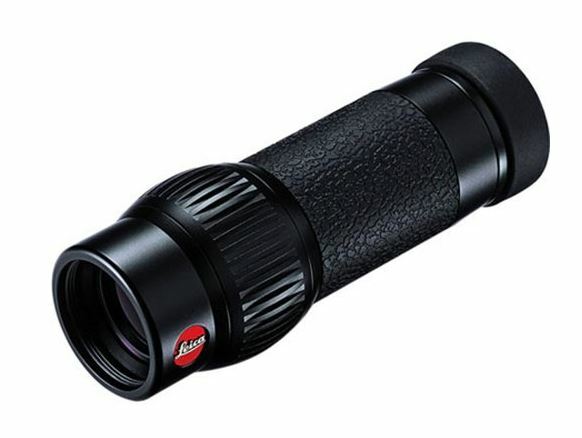 The sleek design of the Leica Monovid 8 x 20 Monocular is highly appealing and can fit comfortably in the palm of the hand. The aluminum shell of the monocular is filled with nitrogen to prevent any internal fogging, and it is moderately waterproof. This monocular's lens is made with patented AquaDura and HDC coatings that improve the total amount of light that can pass through the device (and thus improve the overall image) and is adept at repelling water and dirt. As with any tool, there are a variety of different characteristics or qualities that can make or break it. For monoculars, these characteristics focus on the device's ability to magnify, its portability, and its ability to adjust, among other considerations. These qualities become more narrowed when it comes to looking for a monocular specifically for hunting purposes, as well. Monoculars can also be used as a text magnifier: simply flip the monocular upside down, hold it over text, and voila! This tool is incredibly useful when it comes to trying to see long distances without having to worry about packing a bulkier pair of binoculars. A quality monocular often has a better quality of view, as well. This device is perfect for those individuals who just need a "quick peek" at something far away. While binoculars have an improved field of vision overall because you are using both of your eyes, a monocular is still a highly convenient and efficient tool. 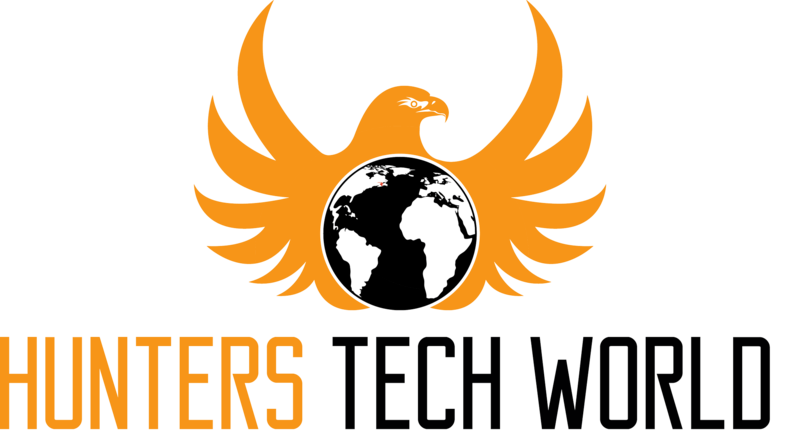 Nick Stucker of Optic Gear Lab explains that a monocular might work better for an individual who has eyesight issues that are stronger in one eye over the other. Figuring out what style of magnification will work for you is the first step; then you can decide which tool to purchase. For the purposes of this article, the monocular will be looked at in more depth to better understand its usage. Having a good monocular can also help with navigation when out in the wilderness, especially when used with a good hunting GPS. On a hunting trip, it is unlikely that you will encounter a situation where extreme magnification is necessary. After all, there is such a thing as too much of a good thing, and too much magnification in a dense forest will not help you see past the trees any better. However, if you are doing hunting on a wide plain, more magnification might benefit your search for game. Thus, the first logical step in choosing a monocular is to go in with a clear understanding of what kind of hunting you will be doing. Higher degrees of magnification can also inhibit the operating power of your monocular. This is because the more magnification power a lens has, the more difficult it is to focus in on your target. In hunting, this is not an acceptable risk, and therefore a lower magnification level is usually the best option. Also, the less the magnification, the smaller the lens (usually), which also means the less cumbersome the tool. One important aspect of a quality monocular to consider before purchase is whether or not the device has a good close focus in addition to its far focus. Which focus will work best for you is determined by your specific needs: will your hunting involve longer or shorter distances from your objective? Again, have a clear idea of the type of hunting you are doing before you commit to a monocular. The larger the lens size the greater the amount of light that can be gathered into your monocular. This generally creates a clearer, brighter view, but larger is not always better as larger lenses often mean larger monoculars which can be heavy and more cumbersome than their lightweight version. Make sure you balance size, efficiency, and convenience when choosing a monocular. "Field of view" refers to how much you can see when you look through a monocular. More technically, Professor John E. Greivenkamp in his book Field Guide to Geometrical Optics describes field of view as "an optical system...often expressed as the maximum angular size of the object as seen from the entrance pupil." Thus, the field of view of a monocular will determine how much of a distant object you can see. The larger the field of view, the smaller the magnification of your monocular, so decide which aspect is more important for your needs before making a purchase. "Eye Relief" is measured as the distance between the monocular and your eye that can be comfortably reached and still allow you to see the full field of view. If you wear glasses, this feature will be very important since the barrier of your glasses will not allow you to get close to the eye piece of the monocular. Choosing a monocular with the right coating will help minimize how much light is lost through the lens and make your field of vision clearer overall. The more thorough the coating, the more expensive the monocular. Depending on your specific needs, a few extra layers of light transmissible coating could make all the difference when it comes to spotting game.